We have many happy days at HubSpot (and some days full of stress, too, like every startup). But today was extra-cool. A bunch of us saw the Governor Deval Patrick, our state’s governor, was going to visit our building (One Broadway, home of the Cambridge Innovacation Center), to learn and share ideas about how to bring more startups to Massachusetts, create good jobs, bring innovative products to market, etc. So some HubSpotters used Twitter to ask the governor to swing by our office. And he did 😉 In person, for a while, with his whole staff. You can see the notes here, here, here, and here (there may be others too). It was a very cool surprise. I give the governor and his staff a lot of credit for their flexibility and openness. I shook the governor’s hand and said hi, as did a bunch of HubSpotters. He was patient, friendly, and accomodating. 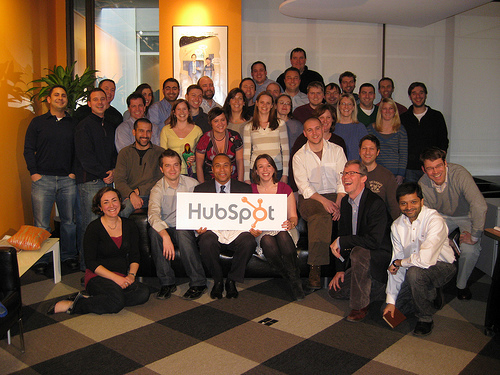 He was even willing to pose with a HubSpot t-shirt and for a group picture with us. You can read more on the HubSpot company blog.